There have been so many people telling me how much they connect with this sentiment! 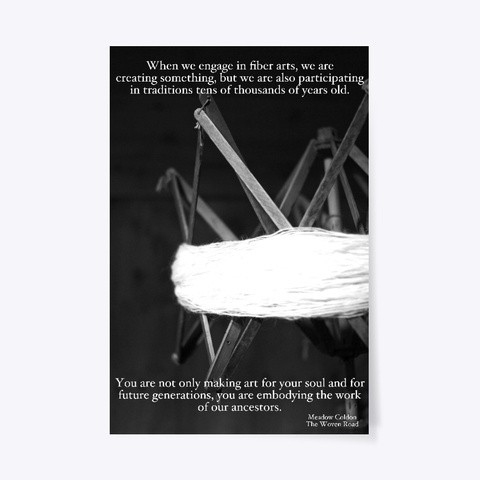 It is now my joy to be able to share this with you, and offer you an opportunity to further the inquisitive, fiber art passion of your studio, home, or business, with this quote from the Woven Road podcast. Whether we are talking about the history of Amish quilting, the domestication of animals for fiber, using the direction of thread twist as evidence of cultural migrations, or how we can better support a more ethical yarn industry, we are all on this journey of knowledge together. The wonderful thing about asking questions, is that it never ends, and you are always surprised. You always discover something you didn’t even know that you didn’t know. When we engage in fiber arts, we are creating something, but we’re also investigating and participating in historic traditions tens of thousands of years old. You are not only making art for your soul and for future generations, you are embodying the work of our ancestors. This is the magic of the woven road. And it is a wonderful place to be. Thanks for enjoying it with me!